The next-generation DOHC, inline all-alloy engine from Honda. It turns clockwise, unlike previous Honda I4s. The VTEC-DI places the fuel injector in the center of the combustion chamber dome and a central recess in the piston. 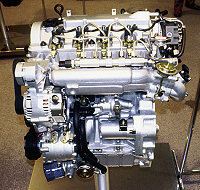 Honda's 2-L engine, which combines a VTEC variable valve timing/lift and a VTC continuously variable timing device. Honda's own small-displacement direct-injection diesel engine. Honda's own PEM fuel-cell stack. Honda also uses a Ballard FC for its FCX-V1 prototype. Honda holds a biennial technical meeting in the same year as, and just before, the Tokyo Motor Show. The most recent one was in the fall of 1999, held at Honda's wholly owned Motegi motor sports complex, where Honda showed some of its latest — and future — technologies. The theme of the meeting was the powerplant. President Hiroyuki Yoshino affirmed that Honda was first and foremost an engine manufacturer, as its official name, Honda Motor Co., would convey. Honda produces more than 10 million engines a year for automobiles, motorcycles, and a variety of power equipment, including marine outboard engines and power generators. Yoshino is not concerned with the number alone, but is adamant that Honda be a truly global company. "We believe success has little to do with size alone," he said. "That is why our strategy is focused on achieving the speed, flexibility, and efficiency of a small company. Combining this with advanced technology and a global reach — the essential elements of a large company — is the key to our independence." He went so far as to declare that Honda would not need mergers or acquisitions to gain factories around the world. Obviously, his strategy does not rule out exchanging major components, as recently demonstrated by its agreement with General Motors, to which Honda will supply its ultra-low-emissions vehicle (ULEV) V6 engines and automatic transmissions. In return, Honda will purchase passenger-car diesels from the GM-affiliate Isuzu for Honda cars to be sold in Europe. In the past, the Honda Technical Meeting had been sort of a casual get-together between Honda's management and engineers and the press, providing the latter with opportunities to both learn and have good wheeled fun. There was also a gentlemen's agreement that some of the advanced technologies were there to see and experience, but not to write about. Yet, it had always been an immensely popular event. This year, however, Yoshino let the press have some good looks at Honda's latest internal-combustion (IC) engine development and its alternative-fuel-system research programs. On the IC engine and fuel cell equation, Yoshio was forthcoming. "Honda is aggressively developing new technologies. We aim to have a production-model fuel-cell electric vehicle by the year 2003." He continued, "But, it is our view that fossil fuels will continue as the primary source of energy for the next few decades. Some people may say Honda is 'stuck' on internal-combustion engines. Rather, I would say we believe it is essential for automakers to continue advancing internal-combustion technology. Certainly that is our commitment. I would say also that is our advantage." 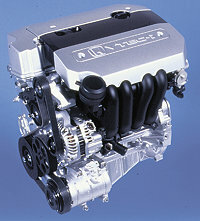 Honda introduced three "next-generation" powerplants at the meeting: a dual-overhead-camshaft VTEC-i 2.0-L inline 4-cylinder unit that may power future mid-size cars, including Accords and derivatives; for further into the future, a direct-injection gasoline engine called VTEC-DI; and a turbocharged, common-rail direct-injection diesel. Additionally, two fuel-cell powered electric vehicles were demonstrated. Up to quite recently, all Honda inline 4-cylinder engines ran counterclockwise, a legacy of the late Soichiro Honda, whose first automotive powerplant happened to run counterclockwise. Now, Honda has two inline engines running clockwise, the longitudinally placed S2000 sports car I4 and the gasoline/electric hybrid Insight's triple. All Honda V6s run clockwise, by the way, in consideration of the company's joint project with Austin-Rover of Britain. Honda is now in the process of updating its inline engines, with the DOHC VTEC-i 2.0-L 4-cylinder spearheading the change. Honda's development target includes an increase of over 20% in power, a 10% increase in low-to-mid-speed range torque, a 10 to 20% increase in fuel efficiency, meeting LEV II/Tier II exhaust emissions standards, and a reduction in size and mass of 10%. The VTEC-i designation's small "i" stands for intelligent, and it combines two features. The VTEC feature alters valve timing/lift by switching cam profiles, in this engine's case applied both to the intake and exhaust cams. The VTC feature is a continuously variable intake valve-timing device, employing a vane-type actuator. Actually, Toyota had preceded Honda with its 2ZZ-FE 1.8-L I4 for the updated Celica coupe, which combines similar variable devices (AEI Jan. 2000). By switching cam profiles, the engine's air-intake efficiency is improved, resulting in higher power output. The VTEC's profile-switching facility is used to deactivate the intake valves in each cylinder, generating powerful swirl, which enables burning of leaner air-fuel mixtures, even in colder operating conditions. This reduces carbon dioxide emissions. The continuously variable timing VTC feature contributes to higher torque output, reduction of pumping loss (less CO2 emissions by improved efficiency), and lowering oxides of nitrogen (NOx) emissions. The new clockwise-revolving engine is transversely installed with its intake side facing forward, with shorter exhaust tubes/tube to the underfloor catalytic converter, aiding the latter's quicker light-off. The current engine relies both on VTEC and exhaust gas recirculation (EGR) for an ultra-lean air/fuel ratio operation, while the new version does so without a hefty dose of EGR. The downstream exhaust tube, between the collector and catalyst, has a two-chamber "e" section, which, according to Honda, results in lower heat mass than the current engine's dual tubes enclosed in an outer casing. The new engine has a modular design. 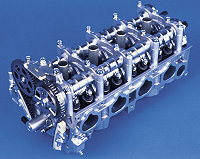 It features a variable-length induction system, plastic intake manifold, upper and lower block construction cast by a new technique assuring outstanding stiffness and light mass, twin counter-rotating second-order balance shafts compactly packed within the oil sump, and a serpentine-belt auxiliary drive. Like the S2000 sports car engines, twin overhead camshafts are driven by a single-stage chain. Table 1 compares the outer dimensions and masses of the new 2.0-L DOHC VTEC-i and the current 2.0-L unit. Honda utilizes VTEC's ability to deactivate one of the two intake valves in each cylinder to generate powerful swirl/vortex motion of the incoming air. Fuel is injected by a high-pressure, high-penetration swirl injector situated in the center of the combustion chamber, feeding into the central piston cavity. Honda explored charge stratification in the 1970s CVCC principle, successfully meeting the tough U.S. Clean Air Act standards as well as Japan's own tightening emissions control. The new VTEC-DI burns ultra-lean air/fuel mixtures, up to a 65:1 ratio, vs. up to 45 to 50:1 of most of the production direct-injection gasoline engines. Honda insists the central injector and piston cavity relation prevents cylinder-wall-wetting by injected fuel, which enables leaner air/fuel ratio operation, even during the critical warming-up period and rapid acceleration. Honda gives a specific number of a 22:1 air/fuel ratio vs. the stoichiometric 14.7:1 employed under similar conditions. The DOHC VTEC-DI technology is applied to a 1.4-L inline 4-cylinder engine, whose power and torque outputs have been raised to 80 kW (107 hp) at 6200 rpm and 133 Nm (98 lbft) at 5000 rpm. This engine was installed in a Logo mini car for the media's ride-and-drive. Honda claims the VTEC-DI, calculated in a 2.0-L displacement size, has about a 10% increase in fuel economy over other direct-injection engines on the market. However, whether Honda will go ahead with a production version of the VTEC-DI is unknown. It may remain, for some years anyway, a research project. The diesel may seem the last word for Honda since the company prefers high-power, strato-revving gasoline engines to propel its cars and motorcycles. In fairness, Honda's Power Equipment R&D developed a number of compression ignition engines, though their applications are reserved for a single-cylinder industrial engine and a series of small agricultural tractors. Table 1. 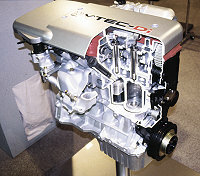 Comparison of Honda's New 2.0-L DOHC VTEC-i and Its Current 2.0-L Engine. The automotive powerplant R&D, too, has been working on the diesel, and its prototype unit, presented at the Technical Meeting, was accompanied by a former Formula 1 engine designer. Honda's aim for developing the diesel was to answer the challenge in Europe: attain the 3-L/100 km (78-mpg) goal, meet the EU 2005 exhaust emissions standards, and create a vehicle whose performance is second to none in the diesel segment. The prototype engine is an overhead-camshaft, 16-valve inline 4-cylinder unit employing a Denso-supplied common-rail direct-injection, variable geometry turbocharger. Typical for Honda, the 1.6-L engine's cylinder block is aluminium with cast-in iron liners. The engine features a Honda-unique combustion chamber configuration, continuously variable swirl control valve, electrically administered EGR, and de-NOx and oxidation catalytic converters. The diesel features the intake-port fitted with a swirl control valve, which promotes fuel atomization and dispersion of injected fuel outside of the piston cavity. This reduces emissions through uniform air/fuel mixtures. The prototype engine is rated at 52 kW (70 hp) at 4000 rpm and 170 Nm (125 lbft) at 1600-3000 rpm. The engine's compact size is demonstrated by a comparison with the company's own 1.3-L gasoline engine. The prototype diesel measures 830 x 512 x 646 mm (33 x 20 x 25 in), vs. the 1.3-L gasoline unit's 856 x 614 x 597 mm (34 x 24 x 23 in). Its fuel consumption is quoted as 3.4 L/100 km (69 mpg). The fate of this diesel is even more unknown now that Honda has entered the agreement with GM/Isuzu. A scale of economics seems to be the key issue here. Honda brought out two fuel-cell-powered prototype vehicles at the meeting, based on the body and running gear of the Honda EV-Plus. The FCX-V1 is driven by a permanent magnet ac synchronous motor of 49-kW (66-hp) output and of Honda's own design and manufacture. Electric energy is supplied by Ballard Power System's PEFC (polymer electrolyte fuel cell) fuel-cell stack of 60-kW (80-hp) output, whose pure hydrogen fuel is stored in a metal hydride tank. Honda is developing its own fuel-cell system, again of PEFC type, of 60 kW (80 hp), which supplies energy to the 49-kW (66-hp) Honda motor in the FCX-V2. This vehicle is equipped with a methanol-hydrogen reformer system. An attending engineer confided that the Honda fuel-cell system's performance was yet to reach Ballard's level of refinement and performance; however, they were making a rapid progress. As with most methanol reformer-equipped FC vehicles, it requires a lengthy start-up time, up to 20 minutes, and the FCX-V2 emitted clean water and huge heat, high enough to boil eggs from its tailpipe. That high heat emitted to the atmosphere, though chemically harmless, is still energy wasted. The FCX-V1 was given to media members to drive around a short course, while the V2 was jealously guarded by Honda engineers.